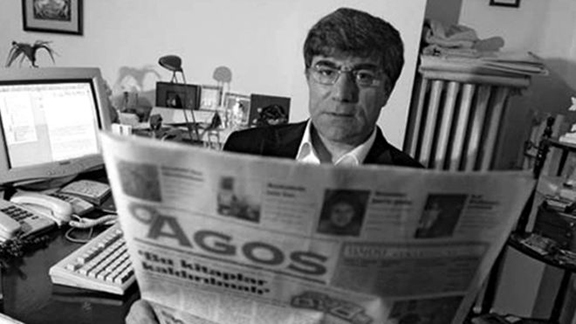 ISTANBUL (Today’s Zaman) — A legal objection has been filed by the family of Turkish-Armenian journalist Hrant Dink, who was assassinated in 2007, against the exclusion of suspects from an indictment prepared against the public officials charged with misconduct and negligence in the investigation of his murder. A total of 50 suspects, including retired Brig. Gen. Veli Kucuk, who was sentenced to life in prison in 2010 on the charge of leading the Ergenekon terrorist organization, have been excluded by prosecutor Gokalp Kokcu from the indictment. The indictment was accepted by the İstanbul Chief Public Prosecutor’s Office on Dec. 9. However, upon the request of the prosecutor’s office, Kokcu removed some names from the list of suspects. Among those names are former head of the National Police Department’s Counterterrorism Unit Selim Kutkan; retired Brig. Gen. Kucuk; Kemal Kerincisiz, an ultranationalist lawyer; Sevgi Erenerol, an attorney representing Ergenekon defendants; former İstanbul Vice Governor Ergun Gungor; and former National Intelligence Organization (MİT) official Ozel Yilmaz. Dink was shot by 17-year-old Ogun Samast on Jan. 19, 2007, in front of the offices of the Agos newspaper, where he served as editor-in-chief. In January 2012 Samast was sentenced to 22 years, 10 months in prison by a juvenile court, while another court ruled for the life imprisonment of Yasin Hayal on the charge of instigating the murder. Another suspect, Erhan Tuncel, was acquitted of murder charges.